We’d love your help. Let us know what’s wrong with this preview of The Boy on the Wooden Box by Leon Leyson. Leon Leyson (born Leib Lezjon) was only ten years old when the Nazis invaded Poland and his family was forced to relocate to the Krakow ghetto. With incr Even in the darkest of times—especially in the darkest of times—there is room for strength and bravery. A remarkable memoir from Leon Leyson, one of the youngest children to survive the Holocaust on Oskar Schindler’s list. To ask other readers questions about The Boy on the Wooden Box, please sign up. ❤Erin❤ It is a very good book, you should read it some time. Is there a lot of violence in the book that would be inappropriate for a pre-teen to read? This was an inspiring and amazing tale of a young boy, caught up in the Holocaust, who not only survived by the grace of God, but went on to make a wonderful life for himself. He suffered horrendous pain during that time, but he didn't let his past define him. He chose to use his past to make him stronger. I should know better than to read books like this. They make me so angry at the persecutors. Whether it's the Holocaust, or things like "A Time to Kill" or "The Help" or whatever. I simply don't understand humanity. I cannot wrap my head around how people can hate someone simply for the color of their skin, or their religion, or their sexual preference, or whatever they find different about them. How can people be so cruel to other people? Nope, I truly don't understand. I got angry reading this book. But I finished it with a profound appreciation for Oskar Schindler. He was a spark of humanity in a living hell. E foi esse feito — ter vivido e sobrevivido ao Holocausto — que o catapultou directamente para a História, elevando-o de ordinário a extraordinário! A Sobrevivência nas piores circunstâncias é a Grande Parteira do Potencial Humano. O Melhor nasce do Pior. É histórico e fatual que não existem Heróis sem Vilões. Os Mestres do Mal são as Parteiras do Bem, e a razão é simples — só o segundo é capaz de vencer o primeiro! "O Rapaz do Caixote de Madeira" é uma história verdadeira e inspiradora. É mais uma história vivida e sofrida em pleno Holocausto! É mais uma...mas é única! Não conheço outra assim! One Sentence Review: Absolutely beautiful and in a perfect world would replace The Boy in the Striped Pajamas as the customary middle grade WWII Holocaust title. Finding excellent introductory books on the Holocaust for young readers is not as easy as it sounds even with the plethora of choices. More often than not they are too brutal for 5th or 6th graders or they don't give enough background to understand the setting and attitudes of people. Other times they are too one-sided presenting the Germans as one-dimensional villains omitting those that resisted the Nazi racist ideology. This story is a balanced account of Jewish attitudes that came from their Finding excellent introductory books on the Holocaust for young readers is not as easy as it sounds even with the plethora of choices. More often than not they are too brutal for 5th or 6th graders or they don't give enough background to understand the setting and attitudes of people. Other times they are too one-sided presenting the Germans as one-dimensional villains omitting those that resisted the Nazi racist ideology. This story is a balanced account of Jewish attitudes that came from their experiences in the first World War, German's being merciful and merciless, and the author's firsthand experiences of surviving the ghetto's and concentration camps, giving it an authenticity more powerful than some of the more emotionally manipulative Holocaust stories. A straightforward account, it tells the horrors the author went through, but it is not graphic in its descriptions making the violence more palatable for the younger reader. The epilogue is a testament to the author's perseverance and courage in overcoming his trauma and living a long fulfilling life. While the start is slow it provides necessary background information. The action picks up in the middle and ends with a bang. When Leon Leyson dad's new factory job landed his family in Krakow, Poland, they didn't realize how it would save their lives as World War II broke out in Europe. His dad's job put his family in contact with Oskar Schindler, the German Nazi that was sympathetic to the Jews and saved 1200 of them from death by claiming their unique skills as necessary for him to run his factory. Leon was the youngest person on "Schindler's list" at the age of 15 and his actions throughout the war saved his life and his family's. Leon took great risks at critical moments appealing to Nazi men in authoritative positions that had the power to kill him or show mercy. He was lucky in many ways, but he was also extraordinarily brave. Amazingly, most of Leon's family survived the ghetto and concentration camps. While the Nazi's tried to dehumanize the Jews, Leon oftentimes found someone, whether civilian or soldier, that represented the good in humanity and his story is tempered with good deeds in the midst of angst. While reading this book I was reminded of the similarities between Leon's experience and slavery in the United States. The Nazi's stripped the Jews of their dignity just like slave owners stripped blacks of their dignity. As the laws eliminated Jewish civil rights over time, Leon marveled at his classmates prejudice. Not all of their family friends had forsaken them. Leon's dad would sell his suits through a friend on the black market that helped put scraps of food on their table. Leon's tale is sprinkled with glimmers of hope and humanity along with the inhumane acts inflicted on the Jews. His description of the rampant starvation and fear as the Nazi's took control of Krakow brings to life daily living. His family didn't think of the future but worked to survive day-to-day as Leon scrounged for potato peels in garbage cans or anything edible. Hunger consumed his thoughts and actions. He also shows how there was no guarantee of a person's safety even with a work permit from Schindler. Yet, in spite of the struggles, he also describes new friendships and new love in the ghettos. How his mother fought having her dignity being stripped by chucking furniture out the second story window so the Nazi's would not be able to reuse it. Leon and his family's resilience against fear and hate shows that attempts to dehumanize the Jews and make them feel worthless did not always work. Leon, his mom, and others risked their lives to retain their dignity as their oppressors tried to take it away. El hombre tal vez sea el ser vivo más peligroso que ha pisado y pisará nuestro planeta. Leon plasma en este libro los horrores y las vivencias de miles de judíos, que como él, vivieron el famoso Holocausto. Es imposible no sentir compasión por ellos, y una vergüenza infinita por ver las barbaridades que comete el hombre. "«Quien salva una vida, salva al mundo entero»"
Oskar Schindler tuvo el valor y el coraje de enfrentarse a esa barbarie y ser un rayo de luz en los corazones de todos esos judíos. El hombre tal vez sea el ser vivo más peligroso que ha pisado y pisará nuestro planeta. Oskar Schindler tuvo el valor y el coraje de enfrentarse a esa barbarie y ser un rayo de luz en los corazones de todos esos judíos. Es muy duro hacer una reseña sobre este tipo de libros. Es cruel, dura, trágica y triste la historia que se cuenta en estas memorias, pero al mismo tiempo es esperanzadora. Un libro que relata lo peor del ser humano junto a lo mejor del mismo ser. Es un libro tan agustiante, que al final del relato me fue inevitable que no se me escapara una lágrima de alivio. An amazing, heartbreaking memoir by the youngest boy on Schindler’s list. In the same vein as Wiesel’s Night, it’ll make you cry more than once. Highly recommend. 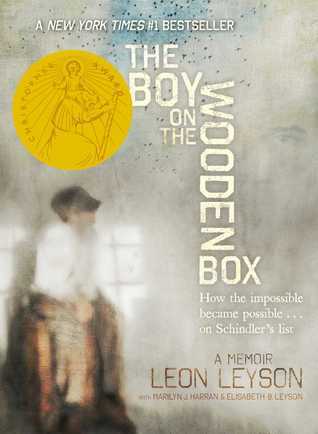 The memoir of Leon Leyson, entitled The Boy on the Wooden Box, follows the profoundly moving true story of his survival through the Holocaust. Leyson was just 10-years-old when the Germans invaded Poland and his family was forced to relocate to the Krakow ghetto. He began working in Schindler’s factory when he was 13. This memoir reinforces many things I already knew about the Holocaust: the terrible hunger, isolation, loneliness, degradation and terror experienced by the Jews. 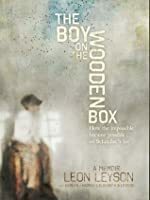 I did not know th The memoir of Leon Leyson, entitled The Boy on the Wooden Box, follows the profoundly moving true story of his survival through the Holocaust. Leyson was just 10-years-old when the Germans invaded Poland and his family was forced to relocate to the Krakow ghetto. He began working in Schindler’s factory when he was 13. As a Jewish boy living in Poland when the Nazis were just beginning to take power, Leon and his friends used to play down by the river. They would grab hold of a low hanging branch and swing across the river and then drop down onto the ground. When he was a little older, his family had moved to another city where he learned how to get free rides on streetcars by getting on when the conductor was at the other end, and getting off when he saw him coming down the aisle for tickets and then getting As a Jewish boy living in Poland when the Nazis were just beginning to take power, Leon and his friends used to play down by the river. They would grab hold of a low hanging branch and swing across the river and then drop down onto the ground. When he was a little older, his family had moved to another city where he learned how to get free rides on streetcars by getting on when the conductor was at the other end, and getting off when he saw him coming down the aisle for tickets and then getting on again at the opposite end. I loved these stories and didn’t want them to end. I didn’t wish to continue reading when things began to change for him and his family; instead I wanted to return to these stories of his youth. They were much like my own childhood memories. It was in the news; Jews were being kicked out of Germany and blamed for its ills. The young boy, Leon, couldn’t grasp this at first; he did not understand the consequences of these actions. Later on the news media was squelched, synagogues and the Torah were being burned, and Jews were being beaten up and killed. Leon’s friends, not being Jewish, deserted him. His life began to change. When I was reading this my mind brought me back to today’s America and to our new president, Donald Trump, who is stirring up trouble, so far, blaming only the Muslims and the Mexicans for America’s ills. Some Mosques are burned and bombed, but this isn’t by the government, it is by individual racists. Trump has stirred this up. Even some synagogues have met with the same fate. Some people are fleeing to Canada, just as the Jews had once fled their own countries. Leon’s parents said that it would all settle down. Many in America are hoping it will settle down here too, but the embers of hatred never die out. They wait, they seethe, they listen, and then they begin to grow and take action. People say there is no comparison; it will not happen here as it did in Nazi Germany. I hope that they are right, but they must know that what happened in Germany and Poland and elsewhere took many years to develop. It didn’t happen overnight. When I see Trump speaking to a police department, I see a man who is preparing them to do even more violence as time goes on. He tells them to use force on suspects. Many of these police officers cheered, but the news stations cut away from this scene before we could grasp that they were even cheering. He tells the immigration department to do the same. There are many things that Trump is doing that Hitler did in Germany, but for the most part it goes unnoticed. People have lost the history or never knew in the first place, or worse yet, some want it repeated. As time went on in Leon’s life, he and his family were sent to the ghetto, and I began seeing a cruelty in mankind that is unfathomable, and it isn’t as though I hadn’t read books about the holocaust, because I have. But for some reason his story began causing me to feel something that I have never felt before in my life, and that I do not have the right vocabulary to explain. It was not nihilism, it was not that life has no meaning, or that people could become this evil and maybe were all along. It wasn’t just emptiness or a hollow feeling. It was all of these things and more. It was also a lost of faith in mankind to do what is right. “As I walked out of he ghetto with its tombstone-crowned walls and along the streets of Krakow, I was dumbfounded to see that life seemed just as it had been before I entered the ghetto. It was as if I were in a time warp…or as if the ghetto were on another planet. I stared at the clean, well-dressed people, busily moving from place to place. They seemed so normal, so happy. Had they not known what we had been suffering just a few blocks away? How could they not have known? How could they not have done something to help us? O carte exceptional de dureroasa, de realista, o poveste despre supravietuire, familie, oameni cu suflet deosebit. O recomand din toata inima! Leib Lejson (conhecido mais tarde como Leon Leyson) era o número 289 da lista de Schindler. Uma lista onde figuravam os judeus que deixariam de estar no “inferno de Plaszów” (campo de trabalho às portas de Cracóvia) e ingressariam num subcampo adjacente às instalações da fábrica Emalia, pertencente a Oskar Schindler. À força de persuasão e subornos a compatriotas nazis, o empresário convencera-os de que era do interesse do partido e da guerra que os trabalhadores vivessem paredes meias com a fábrica e não tivessem que percorrer duas vezes a distância considerável que separava a fábrica de Plaszów. Arriscando a sua própria vida, o único nazi que conheço que está sepultado em território israelita tratou “os seus judeus” como seres humanos, empregou um rapazinho franzino e débil, que tinha que empoleirar-se num caixote de madeira virado ao contrário para poder manobrar os comandos da máquina, deu-lhe uma ração suplementar e tudo fez para que não se visse separado dos seus familiares e para que não perdesse a vida nas mãos dos seus congéneres do partido. Arrancou-os do campo de Plaszów, do campo de Auschwitz e só os abandonou quando a guerra já estava perdida para os alemães e corria perigo de ser capturado pelos soviéticos. Mas “Não conseguiu partir sem se despedir, e reuniu os seus judeus uma última vez.” (pág. 131) Deixou-os livres. Deixou-os vivos. Leon Leyson confessa no epílogo desta obra que reúne as suas memórias que o filme A lista de Schindler mudou a sua vida, que até ao momento do seu lançamento permanecera em silêncio acerca do seu passado, mas que a adaptação cinematográfica de algo tão intimamente ligado a si, ao seu passado e ao da sua família, o fez quebrar esse silêncio e partilhar a sua vida, a sua experiência traumatizante como criança judia sobrevivente do Holocausto com todos aqueles que o quisessem ouvir. Fê-lo inúmeras vezes, para distintos públicos e sem nunca preparar o que iria dizer e relembrar. Dessa partilha resultou este livrinho que me tocou profundamente, que me fez recordar imagens do filme de Spielberg e o quanto as mesmas me violentaram e que me obrigou a engolir a vergonha que sempre sinto quando me deparo com o facto de que o Homem, um ser racional, tem comportamentos indignos, desprezíveis e infinitamente piores do que os dos animais. Essa partilha transportou-me ainda para o país onde as garras exterminadoras do ideal ariano deixaram marcas mais nefastas. Estive na aldeia natal de Leon e sobretudo na cidade de Cracóvia, na qual o nosso protagonista viveu em tempos de paz e em tempos de inferno. Percorri ao seu lado as ruas dessa cidade histórica, senti como se fosse meu o deslumbramento de Leon perante os testemunhos da sua riqueza medieval e acima de tudo encolhi-me de dor, de compaixão e de revolta quando tudo aquilo que ele foi descobrindo nas suas deambulações pelos recantos de Cracóvia lhe foi vedado por muros de mais de três metros e que o mantinham cativeiro num gueto desumano e aterrador. Nenhuma leitura que aborde o Holocausto me deixa indiferente. Não poderia deixar. Mas quando as mesmas são de testemunhos verídicos, a repulsa, o tolhimento e a vergonha atormentam-se por muito mais tempo. Fazem-me questionar tudo e todos, inclusive a mim. Há uma parte nas memórias de Leon que me abanou de forma muito intensa. É a que se refere à sua saída do gueto para o campo de Plaszów – “… fiquei atónito ao verificar que a vida parecia igual ao que era antes. Era como se eu estivesse num túnel do tempo… ou como se o gueto ficasse noutro planeta. Pasmei para as pessoas limpas e bem vestidas, atarefadas de um lado para o outro. Pareciam tão normais, tão felizes… Não saberiam o que nós tínhamos sofrido, a uns escassos quarteirões de distância? Como poderiam não saber? (…) Que a nossa miséria, o nosso confinamento e a nossa dor fossem irrelevantes para as suas vidas era simplesmente incompreensível.” (págs. 92, 93) Os gentios polacos tinham continuado com as suas vidas, mesmo com um gueto dentro de portas. Optaram por fechar os olhos e ignorar que a fome, as condições desumanas, as deportações e uma máquina hedionda estavam a dizimar homens, mulheres e crianças apenas porque professavam uma religião diferente. É óbvio que nem todos viraram a cara. É óbvio que muitos ajudaram como puderam aqueles que até ao dia 1 de setembro de 1939 haviam sido seus vizinhos. Mas a grande maioria baixou a cabeça e preferiu ignorar, não saber. Deixou-se tolher pelo medo e pelo instinto de sobrevivência. E aqui me pergunto? Será que eu, se me visse em pleno palco de uma guerra de proporções mundiais, a poucos metros de um cenário de matança desenfreada e injustificável, me encolheria, olharia para o outro lado ou me levantaria contra o mal e tentaria fazer a diferença? Quero acreditar que seria forte e audaz como o foi Oskar Schindler ou tantos e tantos anónimos alemães, polacos, austríacos, holandeses, belgas ou franceses, mas… seria capaz? É por isso que os olho a todos e, neste caso, a Schindler como um herói, um ser extraordinário que sempre merecerá a minha total admiração. E é também por isso que sigo com a minha obsessão, que procuro de forma quase doentia narrativas totalmente verídicas ou baseada em factos verídicos sobre as Grandes Guerras ou sobre a Guerra Civil Espanhola. Porque as mesmas são um ensinamento, são lições que nunca deveremos esquecer e são testemunhos do pior e do melhor que nos compõem como seres humanos. Leon Leyson faleceu no início de 2013, um dia depois de entregar o manuscrito final deste livro à editora. Havia cumprido a sua missão. A mim só me resta agradecer-lhe a partilha. Tornou-me mais rica, um ser melhor. Como leitora, continuo a sua missão e peço-vos que façam o mesmo que eu. Não deixem que o mundo se esqueça de Leon ou de Oskar Schindler. Por favor. Com esta leitura participo no desafio literário do Goodreads Leituras do Holcausto III. Obrigada, Isa! This is my first time reading a memoir about someone’s experience during the Holocaust. It’s terrifying to read Leon’s experience as he was only ten when the incident happened. With grit, perseverance and incredible luck, he and his family survived because of Oskar Schindler by being in his famous list. The story of Leon Leyson is worth to tell to the world. Livro autobiográfico sobre a criança na Lista de Schindler, "O rapaz do caixote de madeira" é um livro simples, complexo, maravilhoso e aterrador. Simples na escrita, o que o torna perfeito para um público juvenil; complexo porque tem várias camadas a explorar; maravilhoso porque conta a história de um homem que não permitiu que o passado o definisse; e aterrador porque ...bem, é o Holocausto. No sé cómo se puede ratear algo como esto, así que le doy cinco estrellas. Es que no es una obra literaria que haya que calificar, sino que un testimonio. Desgraciadamente, es uno de esos donde la realidad supera a la ficción, y no de una manera positiva. Bueno, en las partes malas, porque en las partes buenas... es muy lindo. Pero lindo porque AL FIN hubo algún tipo de salvación, de justicia. O sea, es un lindo en contraposición a lo malvado. Uno agradece que hubo un rescate, pero al mismo tiem No sé cómo se puede ratear algo como esto, así que le doy cinco estrellas. Es que no es una obra literaria que haya que calificar, sino que un testimonio. Desgraciadamente, es uno de esos donde la realidad supera a la ficción, y no de una manera positiva. Bueno, en las partes malas, porque en las partes buenas... es muy lindo. Pero lindo porque AL FIN hubo algún tipo de salvación, de justicia. O sea, es un lindo en contraposición a lo malvado. Uno agradece que hubo un rescate, pero al mismo tiempo ES EL COLMO que se haya vivido una situación como esa en primer lugar. Es como el síndrome de Estocolmo. Esto no lo digo contra Schindler, en todo caso, sino que contra la situación en general... porque Schindler se nota que actuó bien, aunque él mismo dijo que era lo mínimo. Y lo mismo dijo la señora que escondió a la familia de Ana Frank en Amsterdam. O sea, ES lo mínimo, pero igual la situación no es fácil y ñoeqihgoghhxeja. Desesperación. SUFRÍ, QUÉ HORRIBLE ES LA VIDA. Creo, en todo caso, que es de los mejores libros que he leído sobre el tema. Básicamente porque es verdad y se nota. No está matizado para ganar público. Ni siquiera se detiene demasiado en cada experiencia, y entonces se siente como si todo sucediera en cámara rápida. Tiene partes muy emocionantes, y está escrito con mucha ternura. Me rodaron lagrimones, de esos que salen solos, sin ni siquiera apretar la cara. Sin embargo, me abruma que la vida entera, desde cierta perspectiva, sea tan rápida. Se nota especialmente cuando uno lee la historia de alguien, y puede resumir en pocas horas lo que fue TODO SU PASO POR EL MUNDO. Este hombre nace, vive y muere, comparte su historia, y después, ¿qué será de é? Es uno entre millones, y eventualmente será olvidado. Lo mismo el Holocausto, ¿cuánto tiempo se recordará el sentido último de la experiencia? La especie humana tiene mala memoria, y sigue cometiendo genocidios en cada generación. Entonces, ¿qué sentido tiene? ¿Cuál es el punto? Algunos aprenden de lo sucedido, pero luego es como si hubiera algo adentro de las personas que hace que cometamos una y otra vez los mismos errores. El mismo Leyson lo comenta, de hecho, en la parte final: Vive feliz en Estados Unidos, un país libre, y de pronto se toma una micro, y ve que los asientos se dividen entre blancos y negros. Otra vez el mismo demonio, pero en una diferente forma. ¿Cambiaran alguna vez de verdad las cosas? ¿Es eso físicamente posible? Cuando lo miro de esa manera, no le veo el punto y no me dan ganas de participar EN LA EXISTENCIA. Quizá de verdad solo tengamos el ahora. Ya, parece que hoy estoy muy existencialista. Con su permiso, me voy a ir a gastar mis ahorros en cosas divertidas, para evadirme de este mundo sinsentido, jajaja. En fin, en conclusión y aunque no lo parezca... lo recomiendo. Es súper bueno y además cortito y, como comenté antes, de los mejores que he leído del topic. Honesto y sencillo, el autor irradia un enorme gusto por vivir, y hay quienes dicen que eso es una característica de los sobrevivientes, que viene DE HABER SOBREVIVIDO... pero yo creo que sobreviven los que YA TENÍAN esa energía alegre. Cuando pueden, claro. Porque es lo que les permite aferrarse a la vida. Amazing! Leon Leyson was the youngest survivor on Schnidler's list. His parents and 3 of his 5 siblings survived Nazi Germany because of Schnidler's. Leon tells his story of survival and how without Schnidler they would not of survived. The paragraph in the book when Leon explains how he can't understand how the Nazi's hated the Jews so sadly reminds me of the way people talk about the Mexicans, the Blacks, and many others in our country today. "We were a single detested group...the exact opposi Amazing! Leon Leyson was the youngest survivor on Schnidler's list. His parents and 3 of his 5 siblings survived Nazi Germany because of Schnidler's. Leon tells his story of survival and how without Schnidler they would not of survived. The paragraph in the book when Leon explains how he can't understand how the Nazi's hated the Jews so sadly reminds me of the way people talk about the Mexicans, the Blacks, and many others in our country today. ¿Qué puedo decir yo sobre la historia de Leib? Creo que fue un niño y un hombre muy fuerte, vivió en el infierno mucho tiempo y logró salir y seguir adelante, eso lo transformó en un héroe. Estos temas en general me tocan la fibra sensible y esta historia no ha sido la excepción. Toda la familia Leyson, como tantos otros, sobrevivió a uno de los horrores más grandes de nuestra historia y creo que lo que hizo Leon al contarnos su historia, es mostrarnos que por más que duela no debemos olvidar, la ¿Qué puedo decir yo sobre la historia de Leib? Creo que fue un niño y un hombre muy fuerte, vivió en el infierno mucho tiempo y logró salir y seguir adelante, eso lo transformó en un héroe. Estos temas en general me tocan la fibra sensible y esta historia no ha sido la excepción. Toda la familia Leyson, como tantos otros, sobrevivió a uno de los horrores más grandes de nuestra historia y creo que lo que hizo Leon al contarnos su historia, es mostrarnos que por más que duela no debemos olvidar, la memoria del mal que podemos provocar o sufrir es lo que debe mantenernos en el buen camino. La historia nunca debería repetirse. I've read many stories/books about the Holocaust, however, this is a must read for those that have any interest in this subject. Leon Leyson was on Shindler's list. He and his family became friends with Oskar Shindler, a German, that attempted to save as many Jewish lives as possible thru his factories that he owned. This story has its' Highs and Lows as one would expect. After Leon and his family members were liberated they came to America and that is another story. A great story. This book is a I've read many stories/books about the Holocaust, however, this is a must read for those that have any interest in this subject. This book is an excellent and a fairly quick read - just over 200 pages and styled for the young adults. No puedo no dar cinco estrellas al relato de un hombre que pese a las adversidades más desgarradoras supera su propia historia y la comparte. El relato de Leon Leyson, un niño, adolescente y adulto que se convierte en un héroe a los ojos de quienes leemos su testimonio. Un sobreviviente del holocausto, perteneciente a la "lista de Schindler" que nos relata de manera conmovedora todo su sufrimiento y el rol que juega Oskar Schindler en el proceso de salvación de él y su familia. Me gustó conocer el No puedo no dar cinco estrellas al relato de un hombre que pese a las adversidades más desgarradoras supera su propia historia y la comparte. Me gustó conocer el papel que desempeñó este "nazi" en la protección y salvación de miles de judíos enfrentándose a su propia gente y arriesgándose la vida en ello. I learned that the Jews had to go through a lot more than death camps and discrimination. This book is amazing and sad. A powerful testimony, wrote in first person by a Jew who went through so many terrible things, but manage to survive. This book is also a thank you to Oskar Schindler, whom had an important role in saving this boy and his family. I read this so one of my students could have an alternative to Night, and it is definitely a good choice. Leyson’s story is heartbreaking and written in a way that younger readers can understand the terrible things he and others went through during the Holocaust. I also liked how he talked about life after he was liberated. That does not often happen in these stories, and he was such an inspiring person. Ya me habían dicho que era una buena historia y fui con las expectativas altas... y realmente es muy recomendable. Conmovedora desde todo punto de vista, pues es narrada desde la visión de León como un niño que va viendo como llega la guerra a su vida y a la de su familia y sobre la historia del gran Oskar Schindler. Si la ven en librerías no duden en comprarla y leerla. Vale la pena recorrer cada página. I really enjoyed this book even though it was a very easy read. It was heart warming and a book I would recommend to everyone. The plot was very simple and relatable. Also it takes a perspective that is not seen very often as a person that survived a concentration camp. So it is a good book that I would recommend because of its different perspective and easiness to read. El chico sobre la caja de madera de Leon Leyson es una novela de no ficción, narrada en primera persona, acerca de las penurias que el protagonista (Leon) y su familia sufrieron en los campos de concentración nazis. La historia comienza con la narración, por parte de Leon, de su vida antes de la Segunda Guerra Mundial y del infierno que luego viviría cuando el antisemitismo (hostilidad hacia los judíos basada en prejuicios religiosos, raciales, culturales y étnicos) se hiciera más descarado y cr El chico sobre la caja de madera de Leon Leyson es una novela de no ficción, narrada en primera persona, acerca de las penurias que el protagonista (Leon) y su familia sufrieron en los campos de concentración nazis. La historia comienza con la narración, por parte de Leon, de su vida antes de la Segunda Guerra Mundial y del infierno que luego viviría cuando el antisemitismo (hostilidad hacia los judíos basada en prejuicios religiosos, raciales, culturales y étnicos) se hiciera más descarado y cruel. Leon y su familia eran de Narewka (Polonia), pero pronto se mudaron a la ciudad de Cracovia en busca de mejoras económicas. Su familia estaba conformada por su padre, Moshe, su madre, Chanah; los hermanos varones Hershel, Tsaling, David; y la única hermana mujer, Pesza. Leon era el menor de los cinco. A medida que la historia avanza iremos conociendo un poco acerca de cada uno de ellos. La Segunda Guerra Mundial comenzó cuando el 1 de septiembre de 1939, los alemanes invadieron Polonia, en su intento de fundar un gran imperio en Europa. Los campos de concentración se crearon de inmediato. Estos campos, tanto de concentración, como de trabajo y de exterminio, se crearon casi de inmediato, con el fin de mantener presos y exterminar a judíos, disidentes políticos, homosexuales, gitanos, Testigos de Jehová y demás colectivos calificados como "inferiores" o "traidores" por el ideario nazi. Los campos más sangrientos fueron Auschwitz-Birkenau, Treblinka, Belzec y Dachau, donde morían 1000 personas por día con un total de 39 campos de concentración. Aunque la historia de Leon es, obviamente, triste y desoladora; no recae en narraciones crudas ni desagradables que sean demasiado oscuras para el joven lector. A la misma medida de El diario de Anna Frank, esta novela conmueve desde el comienzo y aunque desde que agarras el libro sabes que el protagonista se salva, eso no te ahorra un par de lágrimas. Aunque he intentado no emocionarme demasiado con la historia... no lo he logrado. A veces las frases más cortas me hacían conmover. Como lo ocurrido con Tsaling, en una sola frase me hizo lloriquear. La narración es muy sencilla y fácil de seguir, por lo tanto, la lectura se realiza en un suspiro si se quiere, pero les recomiendo que la lean con mucha atención, pues es una historia que perdurará en sus memorias. Leyson was the youngest child in his family and possibly the youngest of the hundreds of Jews rescued by Oskar Schindler. The contrasts between his happy childhood in the loving embrace of his parents and siblings and their increasing desperation to survive the tightening snare of Nazi persecution are conveyed with simplicity and directness. His descriptions of life in the ghetto and camps are like many we've read before, but what he tells of the conditions in Schindler's factory, the small but Leyson was the youngest child in his family and possibly the youngest of the hundreds of Jews rescued by Oskar Schindler. The contrasts between his happy childhood in the loving embrace of his parents and siblings and their increasing desperation to survive the tightening snare of Nazi persecution are conveyed with simplicity and directness. His descriptions of life in the ghetto and camps are like many we've read before, but what he tells of the conditions in Schindler's factory, the small but vital kindnesses Schindler bestowed, the risks Schindler took on the behalf of "his Jews" are vivid and new. Simply put, this book was wonderful. A biography for children written by a man who experienced WW2 as a persecuted Jewish child. For the most part, it's what you would generally expect from such a book, telling of horrific days, weeks, years in ghettos and camps but what makes it a good one for children/early teens is that it carries a message of hope and humanity too. Instead of a story where the author is the only surviving person that they knew from that time, this is a story of survival. All Simply put, this book was wonderful. A biography for children written by a man who experienced WW2 as a persecuted Jewish child. For the most part, it's what you would generally expect from such a book, telling of horrific days, weeks, years in ghettos and camps but what makes it a good one for children/early teens is that it carries a message of hope and humanity too. Instead of a story where the author is the only surviving person that they knew from that time, this is a story of survival. All because of one man. Oskar Schindler. We've all heard of him, but I didn't really know all that much about him and what he did. This has completely opened my eyes; I want to go hunting for more information about this spectacular man. Reseña en el blog: La cueva de Danny. mejor en las peores circunstancias." Este sin duda es una historia cruda, trágica y que te atrapa desde la primera página, vives a través de Leon, que nos narra la historia todas las vivencias y todo lo cruel y difícil que fue pasar por los abusos de los nazis, una historia conmovedora que te hace sentir emociones diferentes desde rabia, tristeza y un poco de esperanza de la cual Leon, a pesar de lo mal Reseña en el blog: La cueva de Danny. Este sin duda es una historia cruda, trágica y que te atrapa desde la primera página, vives a través de Leon, que nos narra la historia todas las vivencias y todo lo cruel y difícil que fue pasar por los abusos de los nazis, una historia conmovedora que te hace sentir emociones diferentes desde rabia, tristeza y un poco de esperanza de la cual Leon, a pesar de lo mal que lo estaba viviendo aun tenía. El niño de Schindler es un libro que llega muy adentro ya no sólo por la historia que te cuenta sino por cómo lo hace, por la cercanía y la bondad que transmite Leon Leyson durante toda la novela. Un testimonio real de un superviviente del Holocausto que nos muestra que en este mundo siguen existiendo personas buenas que no dudan en arriesgar su vida para ayudar a los demás. Reading this broke my heart. Going into this memoir, I knew there would be sorrow, inhumanity and death, but the cruelties inflicted upon the Jewish and other populations of people during WWII are beyond horrific. It is difficult to read yet immensely important. With that said, the strength and courage people found within themselves to survive or fight back against the Nazi Regime is remarkable. The small acts of kindness and moments of hope are true testimets to the humane spirit. I hope books l Reading this broke my heart. Going into this memoir, I knew there would be sorrow, inhumanity and death, but the cruelties inflicted upon the Jewish and other populations of people during WWII are beyond horrific. It is difficult to read yet immensely important. “- No puedes sentarte ahí -dijo-. Los asientos traseros son para los negros. Tienes que cambiarte a la parte delantera.